Blogging has become a universal issue. With hundreds of millions of blogs, nowadays everyone can start one. However, many of these blogs remain inactive, condemned to oblivion, and most of them are simply ineffective and therefore invisible. Nevertheless, the competition is stiff, the stakes are high, and the unstoppable development of the Internet always raises the bar. Only few bloggers meet great success and fortune from frequently blogging outstanding content. It is a fact that companies that run a blog are a lot more successful than those that don’t. They generate a remarkable 130% more leads and 7 times the organic traffic. On the other hand, individual bloggers spend on average 4 to 8 hours a week posting on their blog. This prompts the question as to how they manage to gather the attention of thousands, if not millions, of readers. The infographic (see below) provided by Market Inspector reveals 70 different ways to make your blog successful. Search engine algorithms are constantly changing. No one knows exactly how browsers think, which is certainly a challenge. There is no universal rule that instantly helps you rank at the top search results for Google or Yahoo. Therefore, search marketers, who constantly study this evolving phenomena, have drawn up the key factors that deeply influence a website’s performance and its ranking. Fortunately, blogging is not only about SEO. When running a blog, even the blogger’s attitude highly affects the final outcome. Time, willpower and involvement are essential to developing a performing page. As mentioned before, a few hours a week may be sufficient to create innovative content and improve the overall performance of the blog, but results are certainly dependant on the individual. It is important to be consistently committed to the blog. This means that the blog needs to be updated with new content at least once a week. This provides better visibility, a higher amount of organic traffic and returning visitors which can all turn into concrete results. However, it is fundamental to bear in mind that only great content will be “awarded” and taken into consideration by readers. Concerning writing, blog posts should be neither too long nor too short. Generally, a text of 600 words is a good compromise, giving valuable information while retaining readers’ attention. But in SEO terms, it is important that the keyword density is proportional to the length of the text. According to various experts, the right balance of keywords that makes content worthwhile for search browsers is between 2 and 3 %. Example: Suppose you have to write an 800 word blog post about solar energy. In this case, your meta keyword would be “solar panels”. You need to ensure that by the end of your text, “solar panel(s)” appears between 16 and 24 times throughout it. More importantly, the keyword should also be placed in the anchor text of the title, headings and meta description. All these small changes, combined with unique and high-quality content, will make the blog post relevant in the search results. In the example, the target audience for the blog post would be people interested in renewable energy. Having an overview of readers’ interests and targeting the audience’s demand will always provide positive results. It is important to provide readers with more valuable information than your competitors, and to develop rich and interesting content. More often than not, collecting information is the longest process after writing the blog post itself. But it is essential to give the appropriate professional format to the text. Content is essential, but looks certainly count as well. The layout of the blog is equally important in order to grab the attention of your target. It is important that the blog is visually attractive and that the texts are easy to read. Images, spacing, bolds and lists give the eyes a break, making the overall appearance of the text more enjoyable. On the contrary, condensed texts are heavy and not as effective. Once the blog is complete and the article is ready, it is time to spread the message and build a network of contacts. Outreaching and sharing your news to people is the next phase. Afterwards, it is highly recommended that you link the blog to all social media platforms. Since social media has become an integral part of online marketing, we cannot neglect and underestimate its power. 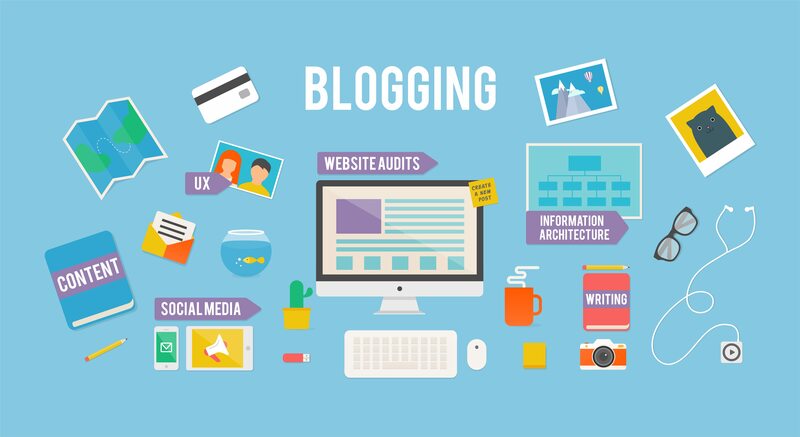 Finally, retaining connections with bloggers and readers, while developing an increasingly larger communication network will help the blog quickly take-off. I love the infographic. These are some great tips to stand by. I think the most important tips are #38 and #40. Knowing who your target market is and thinking like your readers is vital to the success of your blog and content within it. Everything else falls under this. I’m glad you like the infographic. I totally agree with you, even though I think there are lots of key factors to focus on and it’s not easy to give them a priority order. But of course, gathering a specific audience and giving it the best reason to “stay” and to “come back” is crucial to the final outcome. Happy to hear that, thank you for your appreciation.